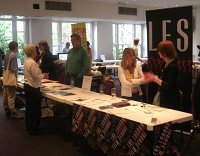 Went to the BECTU London Freelances’ Fair 2008 last Friday at BAFTA Piccadilly. This is the third year of the Fair, and attendance appeared to surpass last year. Informative stalls were complemented by a range of seminars and workshops. At one of the seminars, Dean Whitbread, Chair of the UK Podcasters’ Association, spoke on the exploiting the digital future panel. Following a quick apparatif of Timothy Taylor’s Landlord at the nearby Red Lion, I returned to the BAFTA bar for a lively discussion with event organisors from BECTU’s Writers Producers and Directors Branch.